U.S. new policy today on Tuesday sends Central American asylum seekers back to Mexico while their asylum requests are processed in U.S. immigration courts. 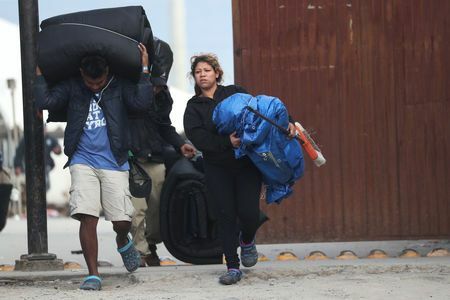 VietPress USA (Jan. 29, 2019): A U.S. Department of Homeland Security spokeswoman confirmed earlier in the day that the United States would begin sending migrants back to Mexico on Tuesday; but Mexican officials had initially expected the transfers to begin on Friday. Asylum seekers have traditionally been granted the right to stay in the United States while their cases were decided by an immigration judge, but a backlog of more than 800,000 cases means the process can take years. U.S. authorities are expected to send as many as 20 people per day through the Mexican border city of Tijuana and gradually start sending people back through the other legal ports of entry, Mexico's foreign ministry said on Friday. TIJUANA/MEXICO CITY (Reuters) - The United States sent the first Central American asylum seeker back to Mexico through a crossing at the border city of Tijuana on Tuesday as part of a hardened immigration policy, an official at Mexico's national migration institute said. The return of a Honduran man was carried out under a U.S. policy dubbed the Migrant Protection Protocols (MPP) by which the United States will return non-Mexican migrants who cross the U.S. southern border back to Mexico while their asylum requests are processed in U.S. immigration courts. The United States is not expected to send any other Central American migrants to Mexico on Tuesday, said the Mexican immigration official, who asked not to be identified. A U.S. Department of Homeland Security spokeswoman confirmed earlier in the day that the United States would begin sending migrants back to Mexico on Tuesday. Mexican officials had initially expected the transfers to begin on Friday. The U.S. policy is aimed at curbing the increasing number of families arriving mostly from Central America to request asylum who say they fear returning home because of threats of violence there. The administration of U.S. President Donald Trump says many of the claims are not valid. Mexico has said it will accept the return of certain people who have a date to appear in a U.S. court, but will reject those who have health problems, are unaccompanied minors or would be in danger in Mexican territory. Immigration advocates fear Mexico is not safe for migrants, who are regularly kidnapped by criminal gangs and smugglers. They have also raised concerns that applicants sent back to Mexico will not have access to proper legal counsel in U.S. courts.